Kapil Dev Nikhanj was India's finest all rounder in cricket. He was born on 6th January 1959 in Haryana. He was the former captain. When Kapil was just 20, he set a new record of scoring 1000 runs and taking 100 wickets. He made this record within a period of one year and 109 days only. Kapil Dev started playing in the first class cricket in 1975, and the opportunity for him to play in a test match for the first time came in 1978 during Indian team's tour to Pakistan. He also achieved the unique double of 4000 runs and 400 wickets, the first ever Indian player to do so. He also set the world record for taking the highest number of wickets (432) in test matches in February 1994. Indian government honoured him with the 'Padmabhushan' award. 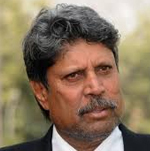 Kapil Dev has written his autobiography under the title 'By God's Decree'.